Sarah Parker (1670-??) – The daughter of Nathan and Mary Ayer Parker Sarah was born in Andover in 1670, Sarah was 22-year-old when she was named in the confessions of Elizabeth Dane Johnson, Sr. and Susannah Post in their confessions of August 1692. Although her mother, Mary Ayer Parker, was accused at about the same time, and within a month was tried, and executed, it doesn’t appear that Sarah Parker was ever indicted. There is nothing more known of her. Margaret Skillings Prince (1625-1706) – Margaret was born to Mr. Skillings and Janet McIlwraith Skillings in 1625 in England. Somewhere along the line, she immigrated to America and she married Thomas Prince in Gloucester in 1649. The couple would have six children. Her husband, Thomas died on January 17, 1690. Two years later, the Widow Prince would be accused of witchcraft along with Elizabeth Dicer, also of Gloucester. The two were accused by Ebenezer Babson on behalf of his mother, the widow Eleanor Babson, on September 3, 1692. Interestingly, just weeks before his accusation, Babson had been involved in another paranormal (or paranoid incident) of spectral soldiers which were allegedly haunting him. Whether he was blaming this other incident on the two women is unknown. In any case, Margaret Prince was indicted and also accused of having afflicted Elizabeth Booth of Salem Village. Her daughter, Mary Prince Rowe, and granddaughter, Abigail Rowe were also accused. Margaret was released from the Ipswich on a £200 bond on December 15, 1692, and appears to have never been tried. She died on February 24, 1706, in Gloucester, Massachusetts. Benjamin Proctor (1659-1720) – The only surviving child of John Proctor and his first wife, Martha Giddons, Benjamin, like many other members of the Proctor family was accused of witchcraft in May 1692. See more of the Proctor Family HERE! Elizabeth Bassett Proctor, c.1651-17??) – Married to John Proctor, both she and her husband were accused of witchcraft and condemned to death. Her husband John was hanged on August 19, 1692, but Elizabeth was given a reprieve because she was pregnant. By the time she gave birth, the hysteria had died down and she was later released. She would later marry for the second time in 1699. See more of the Proctor Family HERE! John Proctor (1631-1692) – Husband of Elizabeth Bassett Proctor, both he and his wife would be convicted of witchcraft and sentenced to hang. 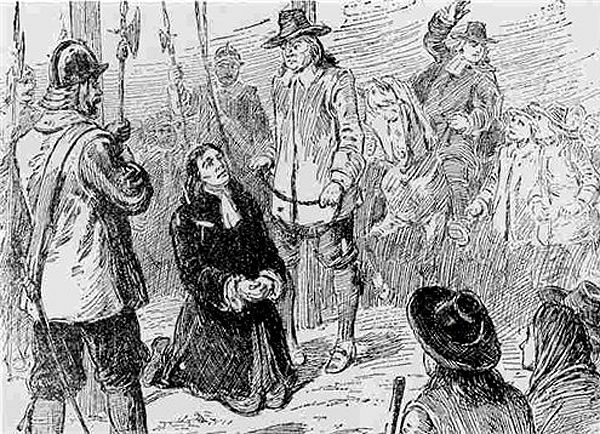 John Proctor was hanged at the gallows in Salem Towne on August 19, 1692, but Elizabeth was given a reprieve because she was pregnant. By the time she gave birth, the hysteria had died down and she was later released. Numerous more members of his family were also accused including Benjamin Proctor, his son from his first marriage; and William Proctor and Sarah Proctor, his son and daughter with Elizabeth Bassett. From Elizabeth’s side of the family, there were several more accused including her sister, Mary Bassett DeRich, and her sister-in-law, Sarah Hood Bassett. See more of the Proctor Family HERE! Sarah Proctor (1676-17??) – The daughter of John and Elizabeth Bassett Proctor, she was accused of witchcraft in May 1692 and imprisoned. See more of the Proctor Family HERE! William Proctor – (1692-??) – The oldest son of John and Elizabeth Bassett Proctor, William was accused of witchcraft in May 1692 and imprisoned. See more of the Proctor Family HERE! Ann Greenslit Pudeator (16? ?-1692) – In her 70’s at the time of her execution for witchcraft, Ann was a well to do widow when she was accused. Nothing is known of where Ann was born or what her maiden name was, but she grew up to marry Thomas Greenslit and the couple would have five children. The couple was thought to have lived in Falmouth, Maine. Somewhere along the line, the family moved to Salem Towne. Thomas Greenslit died in 1674, leaving his wife destitute. She was then thought to have worked as a midwife and a nurse to support the family. In the early 1670’s, she was working for Jacob Pudeator, a neighbor and was nursing his wife Isabel, who was ill. Isabel Pudeator died on March 3, 1675 (or 1676). The childless widower, who was some 20 years younger than Ann Greenslit, married her about a year after his wife died. He was about 35 and she was about 55 at the time of their marriage. Jacob worked as a blacksmith and owned property in Salem Towne. Just five years later, in 1682, Jacob Greenslit passed away leaving bequests to each of Ann’s five children, and the remainder of his property to Ann herself. When the witch hysteria erupted in 1692, Ann found herself a target. Some have theorized that her likely occupation as a nurse and midwife, along with her being a woman of property, made her vulnerable to accusations of witchcraft. A warrant for her arrest was issued on May 12, 1692. She would soon be examined and Sarah Churchill would be the first to testify against her, saying that the elderly woman had presented her with the Devil’s Book and forced her to sign it, as well as having tortured her with poppets with thorns. Before long, the “afflicted girls,” including Mary Warren, Ann Putnam, Jr., Elizabeth Hubbard, Mary Walcott, and Sarah Bibber were falling into fits and accusing her as well, saying that Ann’s specter had pinched, pressed and choked them. Constable Joseph Neal described having found a number of “curious containers of various ointments,” which were thought to have been used for witchcraft. Though Ann Pudeator denied having ever even met those who were claiming to be afflicted, she was indicted and brought to trial on July 2, 1692, where further damaging testimony would be given against her. Mary Warren would say that Ann had caused John Turner to fall from a tree, as well as accusing her of killing her husband Jacob, as well as Jacob’s first wife Isabel. John Best, Sr. also accused Ann of having murdered his wife, whom Ann had served as a nurse. More testimony provided stated that she was able to turn herself into a bird to bewitch people and that she had caused the death of Joseph Neal’s wife. Interestingly none of her children came to her defense during the trial. Ann Greenslit Pudeator was found guilty and sentenced to hang. Afterwards, she wrote a petition to the court which denounced her accusers stating that Mary Warren, Sarah Churchill, John Best, Sr., John Best, Jr., and Samuel Pickworth had borne false witness against her. She would also say that John Best Jr. was a known liar. But, her petition would come to no avail. She was hanged on Gallows Hill on September 22, 1692, the final set of executions resulting from the Salem Witch Trials. In October 1710, the General Court passed an act reversing the convictions of those for whom their families had pleaded, but Ann Pudeator was not among them.